Oshaghnassy against Sir T. Prendergast. The Answer of Sir Thomas Prendergast Baronet, to the Appeal of Joseph Oshaghnassy Gentleman, was brought in. A Petition of William Lord Baron of Howth in the Kingdom of Ireland, was presented, and read; praying, In regard his Counsel are not able to attend at the Hearing of his Appeal this Day, that the same may be adjourned to such other Time as to the House shall seem meet." And thereupon the Agents on both Sides were called in. Ordered, That the said Hearing be put off to Friday next; and the Causes on Cause-days removed in Course. Hodie 3a vice lecta est Billa, intituled, "An Act for repealing the present Duty on Sweets, and for granting a less Duty thereupon; and for explaining and enforcing the Execution of an Act passed in the Ninth Year of His present Majesty's Reign, intituled, "An Act for laying a Duty upon the Retailers of Spirituous Liquors, and for licensing the Retailers thereof;" and for appropriating the Supplies granted in this Session of Parliament; and for making forth Duplicates of Exchequer Bills, Lottery Tickets, and Orders, lost, burnt, or otherwise destroyed." Hodie 3a vice lecta est Billa, intituled, "An Act for laying a Duty upon Apples imported from Foreign Parts; and for continuing an Act, passed in the Fourth Year of the Reign of His present Majesty, for granting an Allowance upon the Exportation of Britishmade Gunpowder; and for taking off the Drawback upon Exportation of Foreign Paper; and for the better securing the Payment of the Bounty on the Exportation of British-made Sail Cloth; and for giving further Time for the Payment of Duties omitted to be paid for the Indentures and Contracts of Clerks and Apprentices." Hodie 3a vice lecta est Billa, intituled, "An Act for the better regulating the Nightly Watch and Beadles, within the Liberty of Saffron Hill, Hatton Garden, and Ely Rents, in the Parish of St. Andrew, Holborn, in the County of Middlesex." To acquaint them, that the Lords have agreed to the aforementioned Bills, without any Amendment. Against Players of Interludes, Bill. With a Bill, intituled, "An Act to explain and amend so much of an Act, made in the Twelfth Year of the Reign of Queen Anne, intituled, "An Act for reducing the Laws relating to Rogues, Vagabonds, sturdy Beggars, and Vagrants, into One Act of Parliament; and for the more effectual punishing such Rogues, Vagabonds, sturdy Beggars, and Vagrants, and sending them whither they ought to be sent," as relates to common Players of Interludes;" to which they desire the Concurrence of this House. Ordered, That the said Bill be read a Second Time To-morrow; and the Lords to be summoned. The Earl of Warwick (according to Order) reported from the Committee of the whole House to whom the Bill, intituled, "An Act for continuing an Act for the more effectual punishing wicked and cvil-disposed Persons going armed in Disguise, and doing Injuries and Violences to the Persons and Properties of His Majesty's Subjects, and for the more speedy bringing the Offenders to Justice; and for continuing Two Clauses, to prevent the cutting or breaking down the Bank of any River or Sea Bank, and to prevent the malicious cutting of Hop-binds, contained in an Act passed in the Sixth Year of His present Majesty's Reign; and for the more effectual Punishment of Persons removing any Materials used for securing Marsh or Sea Walls or Banks, and of Persons maliciously setting on Fire any Mine, Pit, or Delph, of Coal, or Cannel Coal; and of Persons unlawfully hunting, or taking any Red or Fallow Deer, in Forests or Chases, or beating or wounding Keepers or other Officers in Forests, Chases, or Parks; and for more effectually securing the Breed of Wild Fowl," was committed, the Amendments made by the Committee to the said Bill. Which, being read Twice by the Clerk, were, with an Amendment to One of them, agreed to by the House. Murderers of Capt. Porteous, to bring to Justice, Bill. The Earl of Warwick also (according to Order) reported from the Committee of the whole House to whom the Bill, intituled, "An Act for the more effectual bringing to Justice any Persons concerned in the barbarous Murder of Captain John Porteous, and for other Purposes therein mentioned," was committed, the Amendments made by the Committee to the said Bill. Hodie 3a vice lecta est Billa, intituled, "An Act for regulating the Company of Watermen, Wherrymen, and Lightermen, rowing on the River Thames, between Gravesend, in the County of Kent, and Windsor, in the County of Berks." 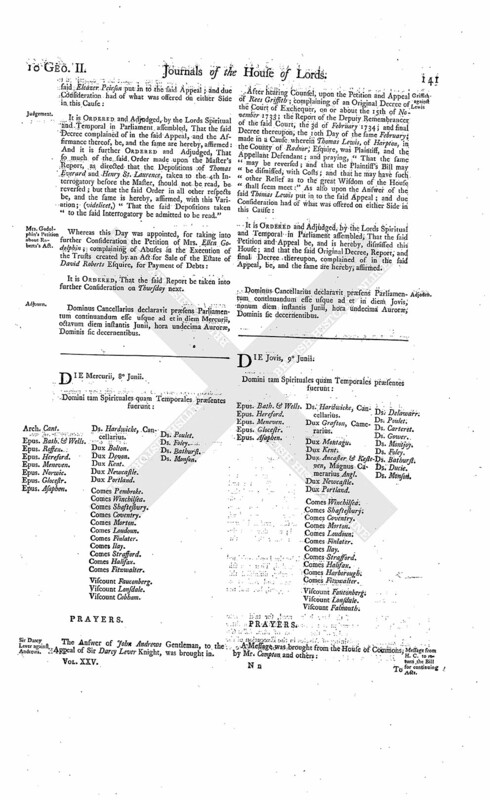 Upon reading the Petition and Appeal of Walter Bagenall Esquire; complaining of Two Orders, or Decrees, of the Court of Exchequer in Ireland, of the 19th Day of November 1735, and 21st of February last, made in a Cause wherein Edmund Dillon was Plaintiff, and the Appellant and others were Defendants; and in a Cross Cause, wherein the Appellant was Plaintiff, and the said Edmund Dillon Defendant; and praying, That the same may be reversed:"
It is Ordered, That the said Edmund Dillon may have a Copy of the said Appeal; and he is hereby required to put in his Answer thereunto, in Writing, on or before Wednesday the 6th Day of July next; and that Service of this Order on the said Edmund Dillon's Clerk in the said Court of Exchequer in Ireland be deemed good Service. Ryland, to revive his Appeal. Upon reading the Petition of Richard Ryland; praying, "In regard One of the Respondents to the Petitioner's Appeal is lately dead; that the same, and all Proceedings thereupon, may stand and be revived, and in the same Plight and Condition as they were at his Death; and that the Petitioner may amend his said Appeal, by making John Fitzgerald, Son, Heir, and Executor, of the said Edward Fitzgerald, a Respondent thereto; and that he may be ordered to put in his Answer:"
It is Ordered, That the said Appeal do stand revived accordingly; and that the Petitioner may amend the same, by making the said John Fitzgerald a Party; and that he do put in his Answer thereunto, in Writing, on or before Wednesday the 6th Day of July next. Clerk of Parliament's Petition, concerning his Room at the House. Upon reading the Petition of William Cowper Esquire, Clerk of the Parliaments; representing, "That the Place allotted for the Petitioner and his Clerks to do their Business, during the Sitting of this House, is very incommodious; and that there is not a competent Allowance of Fire and Candle;" and praying the Consideration of the House, "That such Order may be made, with respect to the Matters aforesaid, as to their Lordships, in their great Wisdom and Goodness, shall seem meet." Viscount Torrington. L. Abp. Cant. Their Lordships, or any Five of them; to meet at the usual Time and Place on Friday next. Clerk Assistant's Petition, concerning Fees for engrossing. Ordered, That the Petition of the Clerk Assistant, formerly presented to this House; praying, "That the Clerk of the Parliaments may be required to come to an Accompt with him, touching One Article in the Table of Fees;" as also a Petition of the Clerk of the Parliaments, in relation to the same Matter, presented soon after the other Petition, and which were both referred to a Committee at the latter End of the last Session, but not then proceeded on; be re ferred to the Committee abovenamed, to take the same into Consideration, and likewise to report; and that it be an Instruction to the said Committee, to view the Acts of Parliament, Journals, and Papers, belonging to this House, deposited in The Parliament-Office. Dominus Cancellarius declaravit præsens Parliamentum continuandum esse usque ad & in diem Jovis, secundum diem instantis Junii, hora undecima Auroræ, Dominis sic decernentibus. 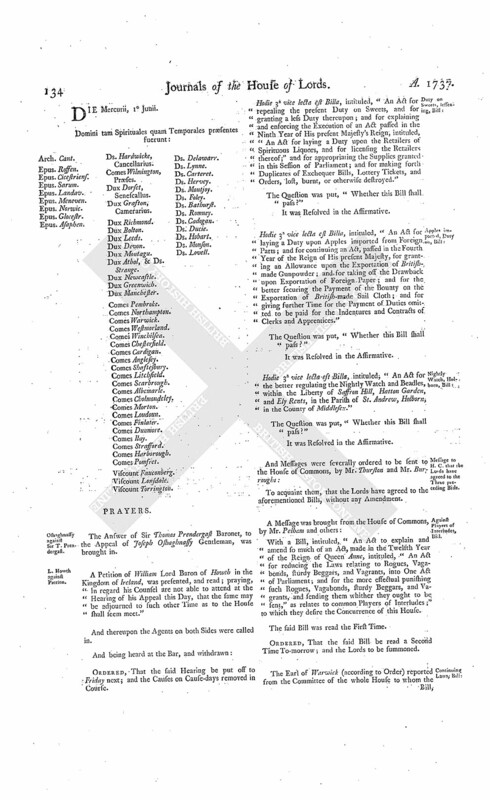 Complaint being made to the House, and Oath made at the Bar, "That William Parkin and Paul Parkin had committed a Breach of Privilege, in pulling down, or causing to be pulled down, a Cottage belonging to the Earl of Strafford, in the Manor of Worsborough and Worsborough Dale, in the County of York, during the Time of Privilege of Parliament:"
Parkins to be attached, for pulling down a Cottage. It is Ordered, That the Serjeant at Arms attending this House, his Deputy or Deputies, do forthwith attach the Bodies of the said William Parkin and Paul Parkin, and bring them in safe Custody to the Bar of this House, to answer for their said Offence; and this shall be a sufficient Warrant on that Behalf. Hodie 3a vice lecta est Billa, intituled, "An Act for the more effectual bringing to Justice any Persons concerned in the barbarous Murder of Captain John Porteous; and for other Purposes therein mentioned." Hodie 3a vice lecta est Billa, intituled, "An Act for continuing an Act for the more effectual punishing wicked and evil-disposed Persons going armed in Disguise, and doing Injuries and Violences to the Persons and Properties of His Majesty's Subjects, and for the more speedy bringing the Offenders to Justice; and for continuing Two Clauses, to prevent the cutting or breaking down the Bank of any River or Sea Bank, and to prevent the malicious cutting of Hop-binds, contained in an Act passed in the Sixth Year of His present Majesty's Reign; and for the more effectual Punishment of Persons removing any Materials used for securing Marsh or Sea Walls or Banks; and of Persons maliciously setting on Fire any Mine, Pit, or Delph, of Coal, or Cannel Coal; and of Persons unlawfully hunting, or taking any Red or Fallow Deer, in Forests or Chases, or beating or wounding Keepers or other Officers in Forests, Chases, or Parks; and for more effectually securing the Breed of Wild Fowl." Princess of Wales's Jointure, Bill. 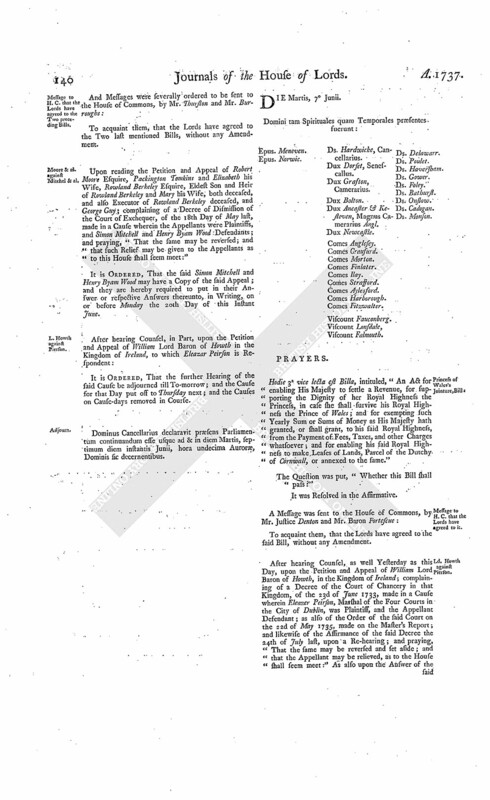 With a Bill, intituled, "An Act for enabling His Majesty to settle a Revenue, for supporting the Dignity of her Royal Highness the Princess, in case she shall survive his Royal Highness the Prince of Wales; and for exempting such Yearly Sum or Sums of Money as His Majesty hath granted, or shall grant, to his said Royal Highness, from the Payment of Fees, Taxes, and other Charges whatsoever; and for enabling his said Royal Highness to make Leases of Lands, Parcel of the Dutchy of Cornwal, or annexed to the same;" to which they desire the Concurrence of this House. 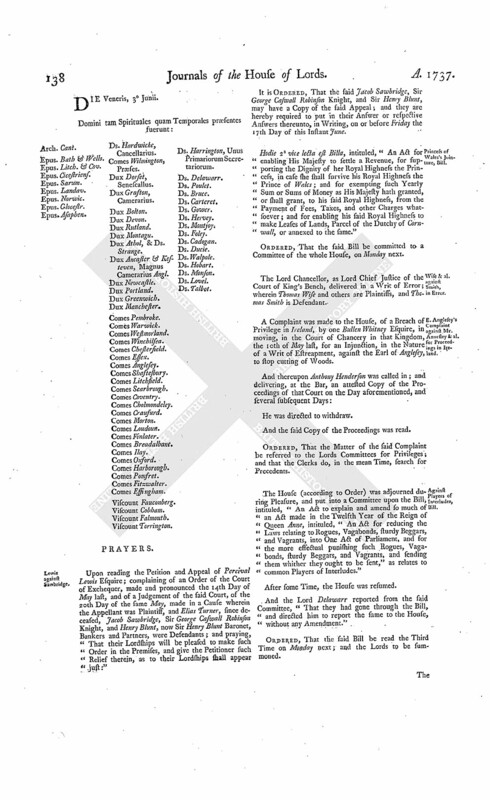 Upon reading the Petition of Charles Lauder and George Anderson, the Appellant and Respondent in a Cause upon an Appeal; complaining of several Interlocutors of the Lords of Session in Scotland; praying, In regard the Petitioners are both attending, at great Trouble and Expence, in order to the Hearing of the said Cause; that the same may be brought forward to some Bye-day:"
Nisbet to enter into Recognizance for Bagenall. The House being moved, "That Mr. Albert Nisbet Merchant may be permitted to enter into a Recognizance for Walter Bagenall Esquire, on account of his Appeal depending in this House; he being in Ireland:"
It is Ordered, That the said Albert Nisbet may enter into a Recognizance for the Appellant, as desired. Against Players of Interludes, &c. Bill. Hodie 2a vice lecta est Billa, intituled, "An Act to explain and amend so much of an Act made in the Twelfth Year of the Reign of Queen Anne, intituled, "An Act for reducing the Laws relating to Rogues, Vagabonds, sturdy Beggars, and Vagrants, into One Act of Parliament; and for the more effectual punishing such Rogues, Vagabonds, sturdy Beggars, and Vagrants, and sending them whither they ought to be sent," as relates to common Players of Interludes." The Question was put, "Whether this Bill shall be committed?" Standing Orders, limiting Time for bringing Appeals, altered. The House (according to Order) proceeded to take into Consideration their Lordships Standing Orders, limiting the Times for bringing in Appeals. "10th Line. 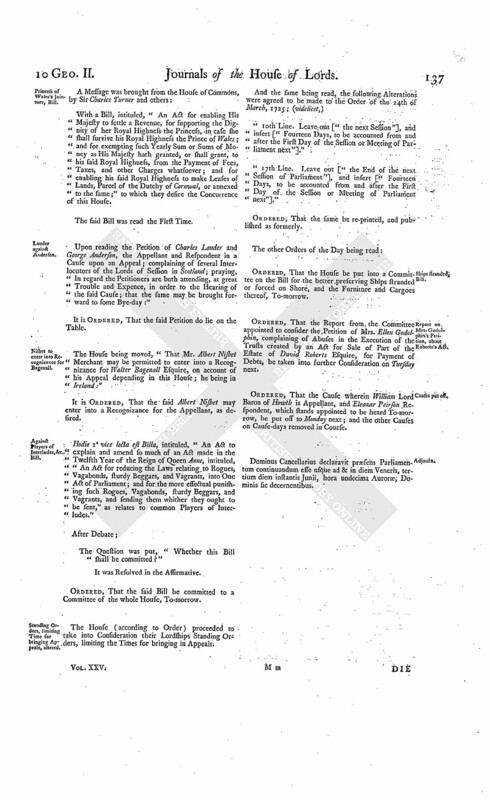 Leave out ["the next Session"], and insert ["Fourteen Days, to be accounted from and after the First Day of the Session or Meeting of Parliament next"]." "17th Line. 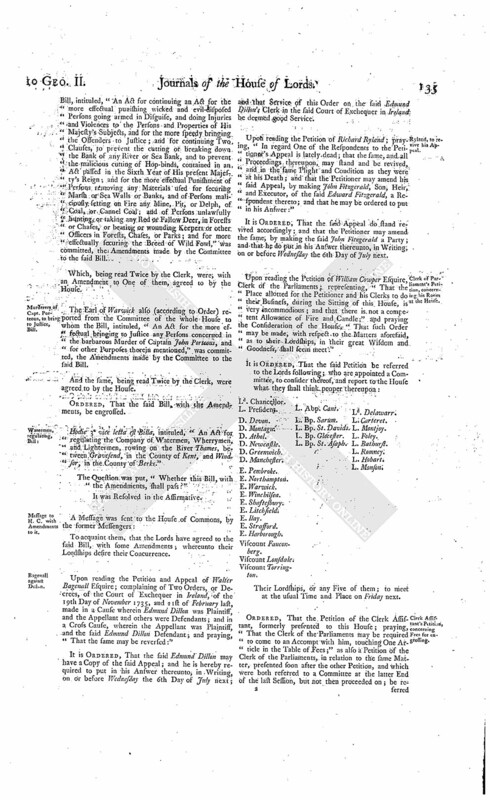 Leave out ["the End of the next Session of Parliament"], and insert ["Fourteen Days, to be accounted from and after the First Day of the Session or Meeting of Parliament next"]." Ordered, That the same be re-printed, and published as formerly. Ordered, That the House be put into a Committee on the Bill for the better preserving Ships stranded or forced on Shore, and the Furniture and Cargoes thereof, To-morrow. Report on Mrs. Godolphin's Petition, about Roberts's Act. Ordered, That the Report from the Committee appointed to consider the Petition of Mrs. Ellen Godolphin, complaining of Abuses in the Execution of the Trusts created by an Act for Sale of Part of the Estate of David Roberts Esquire, for Payment of Debts, be taken into further Consideration on Tuesday next. Ordered; That the Cause wherein William Lord Baron of Howth is Appellant, and Eleazar Peirson Respondent, which stands appointed to be heard To-morrow, be put off to Monday next; and the other Causes on Cause-days removed in Course. Dominus Cancellarius declaravit præsens Parliamentum continuandum esse usque ad & in diem Veneris, tertium diem instantis Junii, hora undecima Auroræ, Dominis sic decernentibus. Upon reading the Petition and Appeal of Percival Lewis Esquire; complaining of an Order of the Court of Exchequer, made and pronounced the 14th Day of May last, and of a Judgement of the said Court, of the 20th Day of the same May, made in a Cause wherein the Appellant was Plaintiff, and Elias Turner, since deceased, Jacob Sawbridge, Sir George Caswall Robinson Knight, and Henry Blunt, now Sir Henry Blunt Baronet, Bankers and Partners, were Defendants; and praying, That their Lordships will be pleased to make such Order in the Premises, and give the Petitioner such Relief therein, as to their Lordships shall appear just:"
It is Ordered, That the said Jacob Sawbridge, Sir George Caswall Robinson Knight, and Sir Henry Blunt, may have a Copy of the said Appeal; and they are hereby required to put in their Answer or respective Answers thereunto, in Writing, on or before Friday the 17th Day of this Instant June. Hodie 2a vice lecta eft Billa, intituled, "An Act for enabling His Majesty to settle a Revenue, for supporting the Dignity of her Royal Highness the Princess, in case she shall survive his Royal Highness the Prince of Wales; and for exempting such Yearly Sum or Sums of Money as His Majesty hath granted, or shall grant, to his said Royal Highness, from the Payment of Fees, Taxes, and other Charges whatsoever; and for enabling his said Royal Highness to make Leases of Lands, Parcel of the Dutchy of Cornwall, or annexed to the same." Wise & al. against Smith, in Error. The Lord Chancellor, as Lord Chief Justice of the Court of King's Bench, delivered in a Writ of Error; wherein Thomas Wise and others are Plaintiffs, and Thomas Smith is Defendant. E. Anglesey's Complaint against Mr. Annesley & al. for Proceedings in Ireland. A Complaint was made to the House, of a Breach of Privilege in Ireland, by one Bullen Whitney Esquire, in moving, in the Court of Chancery in that Kingdom, the 10th of May last, for an Injunction, in the Nature of a Writ of Estreapment, against the Earl of Anglesey, to stop cutting of Woods. And the said Copy of the Proceedings was read. Ordered, That the Matter of the said Complaint be referred to the Lords Committees for Privileges; and that the Clerks do, in the mean Time, search for Precedents. The House (according to Order) was adjourned during Pleasure, and put into a Committee upon the Bill, intituled, "An Act to explain and amend so much of an Act made in the Twelfth Year of the Reign of Queen Anne, intituled, "An Act for reducing the Laws relating to Rogues, Vagabonds, sturdy Beggars, and Vagrants, into One Act of Parliament, and for the more effectual punishing such Rogues, Vagabonds, sturdy Beggars, and Vagrants, and sending them whither they ought to be sent," as relates to common Players of Interludes." Ordered, That the said Bill be read the Third Time on Monday next; and the Lords to be summoned. The House (according to Order) was adjourned during Pleasure, and put into a Committee upon the Bill, intituled, "An Act for repealing the Duties payable ad Valorem upon Foreign Oysters imported into this Kingdom, and for laying another Duty thereon." The last Order of the Day being read, for the House to be put into a Committee upon the Bill, intituled, "An Act for the better preserving Ships stranded or forced on Shore, and the Furniture and Cargoes thereof:"
It was moved, "That the Act made for the like Purpose, in the 12th Year of the Reign of Her late Majesty Queen Anne, might be read." Ordered, That this House be put into a Committee on the said Bill, on this Day Fortnight. Dominus Cancellarius declaravit præsens Parliamentum continuandum esse usque ad & in diem Lunæ, sextum diem instantis Junii, hora undecima Auroræ, Dominis sic decernentibus. Messages from H. C. to return the Bill for regulating Watermen. 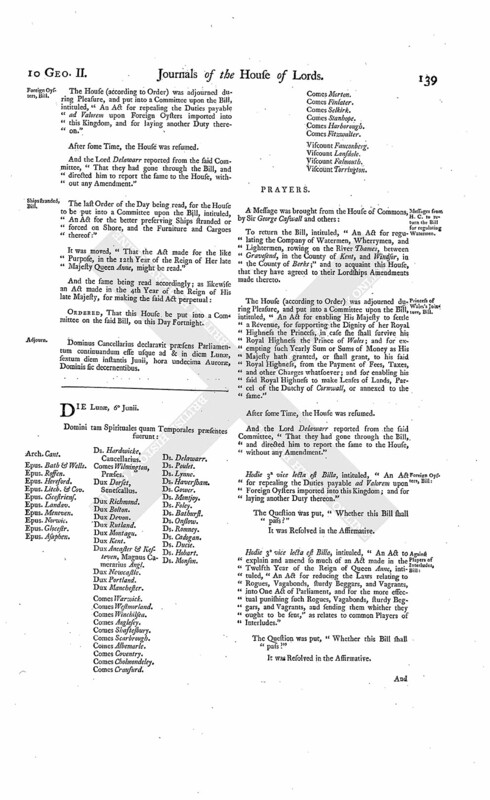 To return the Bill, intituled, "An Act for regulating the Company of Watermen, Wherrymen, and Lightermen, rowing on the River Thames, between Gravesend, in the County of Kent, and Windsor, in the County of Berks;" and to acquaint this House, that they have agreed to their Lordships Amendments made thereto. 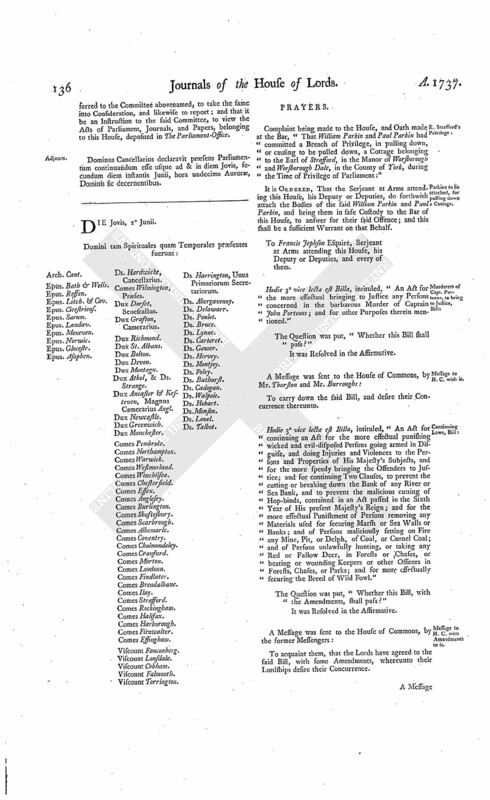 The House (according to Order) was adjourned during Pleasure, and put into a Committee upon the Bill, intituled, "An Act for enabling His Majesty to settle a Revenue, for supporting the Dignity of her Royal Highness the Princess, in case she shall survive his Royal Highness the Prince of Wales; and for exempting such Yearly Sum or Sums of Money as His Majesty hath granted, or shall grant, to his said Royal Highness, from the Payment of Fees, Taxes, and other Charges whatsoever; and for enabling his said Royal Highness to make Leases of Lands, Parcel of the Dutchy of Cornwall, or annexed to the same." Hodie 3a vice lecta est Billa, intituled, "An Act for repealing the Duties payable ad Valorem upon Foreign Oysters imported into this Kingdom; and for laying another Duty thereon." Hodie 3a vice lecta est Billa, intituled, "An Act to explain and amend so much of an Act made in the Twelfth Year of the Reign of Queen Anne, intituled, "An Act for reducing the Laws relating to Rogues, Vagabonds, sturdy Beggars, and Vagrants, into One Act of Parliament, and for the more effectual punishing such Rogues, Vagabonds, sturdy Beggars, and Vagrants, and sending them whither they ought to be sent," as relates to common Players of Interludes." Moore & al. against Mitchel & al. Upon reading the Petition and Appeal of Robert Moore Esquire, Packington Tomkins and Elizabeth his Wife, Rowland Berkeley Esquire, Eldest Son and Heir of Rowland Berkeley and Mary his Wife, both deceased, and also Executor of Rowland Berkeley deceased, and George Guy; complaining of a Decree of Dismission of the Court of Exchequer, of the 18th Day of May last, made in a Cause wherein the Appellants were Plaintiffs, and Simon Mitchell and Henry Byam Wood Defendants; and praying, "That the same may be reversed; and that such Relief may be given to the Appellants as to this House shall seem meet:"
It is Ordered, That the said Simon Mitchell and Henry Byam Wood may have a Copy of the said Appeal; and they are hereby required to put in their Answer or respective Answers thereunto, in Writing, on or before Monday the 20th Day of this Instant June. It is Ordered, That the further Hearing of the said Cause be adjourned till To-morrow; and the Cause for that Day put off to Thursday next; and the Causes on Cause-days removed in Course. Dominus Cancellarius declaravit præsens Parliamentum continuandum esse usque ad & in diem Martis, septimum diem instantis Junii, hora undecima Auroræ, Dominis sic decernentibus. Hodie 3a vice lecta est Billa, intituled, "An Act for enabling His Majesty to settle a Revenue, for supporting the Dignity of her Royal Highness the Princess, in case she shall survive his Royal Highness the Prince of Wales; and for exempting such Yearly Sum or Sums of Money as His Majesty hath granted, or shall grant, to his said Royal Highness, from the Payment of Fees, Taxes, and other Charges whatsoever; and for enabling his said Royal Highness to make Leases of Lands, Parcel of the Dutchy of Cornwall, or annexed to the same." 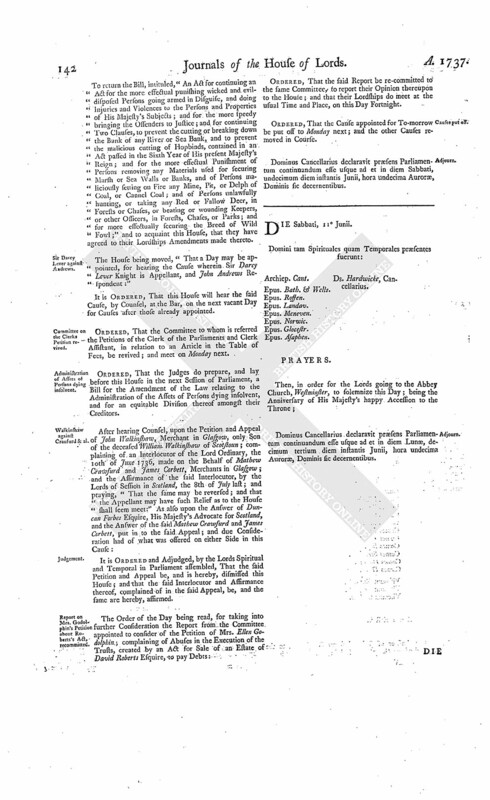 It is Ordered and Adjudged, by the Lords Spiritual and Temporal in Parliament assembled, That the said Decree complained of in the said Appeal, and the Affirmance thereof, be, and the same are hereby, affirmed: And it is further Ordered and Adjudged, That so much of the said Order made upon the Master's Report, as directed that the Depositions of Thomas Everard and Henry St. Laurence, taken to the 4th Interrogatory before the Master, should not be read, be reversed; but that the said Order in all other respects be, and the same is hereby, affirmed, with this Variation; (videlicet,) "That the said Depositions taken to the said Interrogatory be admitted to be read." Mrs. Godolphin's Petition about Robert's Act. It is Ordered, That the said Report be taken into further Consideration on Thursday next. Dominus Cancellarius declaravit præsens Parliamentum continuandum esse usque ad et in diem Mercurii, octavum diem instantis Junii, hora undecima Auroræ, Dominis sic decernentibus. The Answer of John Andrews Gentleman, to the Appeal of Sir Darcy Lever Knight, was brought in. It is Ordered and Adjudged, by the Lords Spiritual and Temporal in Parliament assembled, That the said Petition and Appeal be, and is hereby, dismissed this House; and that the said Original Decree, Report, and final Decree thereupon, complained of in the said Appeal, be, and the same are hereby, affirmed. Dominus Cancellarius declaravit præsens Parliamentum continuandum esse usque ad et in diem Jovis, nonum diem instantis Junii, hora undecima Auroræ, Dominis sic decernentibus. Message from H. C. to return the Bill for continuing Acts. To return the Bill, intituled, "An Act for continuing an Act for the more effectual punishing wicked and evildisposed Persons going armed in Disguise, and doing Injuries and Violences to the Persons and Properties of His Majesty's Subjects; and for the more speedy bringing the Offenders to Justice; and for continuing Two Clauses, to prevent the cutting or breaking down the Bank of any River or Sea Bank, and to prevent the malicious cutting of Hopbinds, contained in an Act passed in the Sixth Year of His present Majesty's Reign; and for the more effectual Punishment of Persons removing any Materials used for securing Marsh or Sea Walls or Banks, and of Persons maliciously setting on Fire any Mine, Pit, or Delph of Coal, or Cannel Coal; and of Persons unlawfully hunting, or taking any Red or Fallow Deer, in Forests or Chases, or beating or wounding Keepers, or other Officers, in Forests, Chases, or Parks; and for more effectually securing the Breed of Wild Fowl;" and to acquaint this House, that they have agreed to their Lordships Amendments made thereto. The House being moved, "That a Day may be appointed, for hearing the Cause wherein Sir Darcy Lever Knight is Appellant, and John Andrews Respondent:"
It is Ordered, That this House will hear the said Cause, by Counsel, at the Bar, on the next vacant Day for Causes after those already appointed. Committee on the Clerks Petition revived. Ordered, That the Committee to whom is referred the Petitions of the Clerk of the Parliaments and Clerk Assistant, in relation to an Article in the Table of Fees, be revived; and meet on Monday next. Administration of Assets of Persons dying insolvent. Ordered, That the Judges do prepare, and lay before this House in the next Session of Parliament, a Bill for the Amendment of the Law relating to the Administration of the Assets of Persons dying insolvent, and for an equitable Division thereof amongst their Creditors. Walkinshaw against Craufurd & al. It is Ordered and Adjudged, by the Lords Spiritual and Temporal in Parliament assembled, That the said Petition and Appeal be, and is hereby, dismissed this House; and that the said Interlocutor and Affirmance thereof, complained of in the said Appeal, be, and the same are hereby, affirmed. Report on Mrs. Godolphin's Petition about Roberts's Act, recommitted. Ordered, That the said Report be re-committed to the same Committee, to report their Opinion thereupon to the House; and that their Lordships do meet at the usual Time and Place, on this Day Fortnight. Ordered, That the Cause appointed for To-morrow be put off to Monday next; and the other Causes removed in Course. Dominus Cancellarius declaravit præsens Parliamentum continuandum esse usque ad et in diem Sabbati, undecimum diem instantis Junii, hora undecima Auroræ, Dominis sic decernentibus.